The panhandle of Texas is dry, but it’s watering holes are not. We ate at the Golden Light (“perhaps the oldest restaurant continuously operating in the same location anywhere on old Route 66”) in Amarillo, TX, which was another stop based on the wisdom of my well-traveled boss. We continued to Lubbock, where we saw The Dutchess and the Duke play (love this song) at Bash Riprock’s and drank beer. What exactly is a Bock anyway? 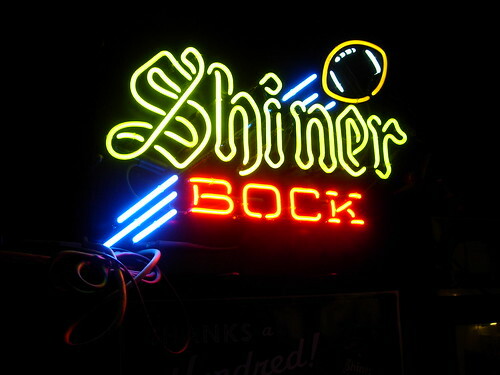 After discovering Texas’s Shiner Bock, I have been seeing many more bocks since. Again, the Dallas Fort Worth airport is a soul-sucking place. But what I don’t understand is why terminal D is so much better than A, B, or C. Terminal D has light! 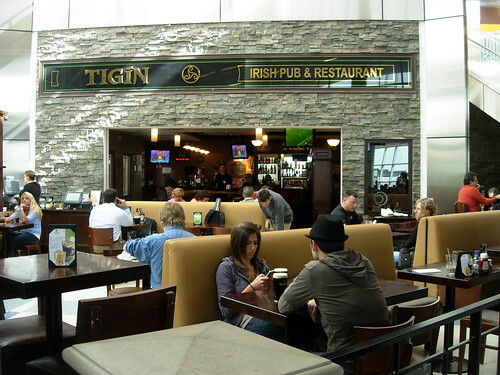 and Irish Pubs! Dining in Houston was all well and good, but with Thanksgiving, Chanukkah, and Christmas all happening, I had much more fun cooking at “home” this time round. I really tried to ignore the mugginess of Houston and force myself to feel fall through food. This meant mashed potatoes, fish, squash, soup, lots of kale, and hot toddys. For dessert one night, Lowell made his mother’s baked apples, which left us with a delicious plate of cinnamon-sugar-butter that I didn’t know what to do with but refused to throw away. 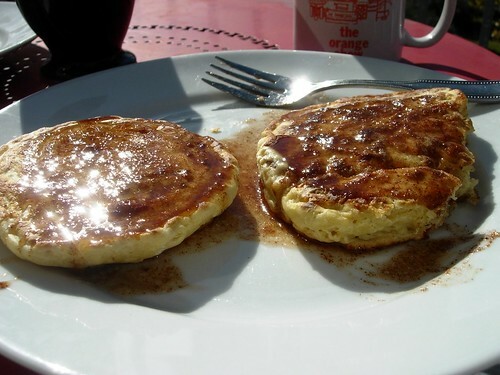 It ended up on pancakes (using an Everyday Pancake recipe from the NYTimes that turned out thick cakes), and it was divine. I might try putting it in the batter next time. Also, Nina and I invented a couple quiches for some remaining pie shells. 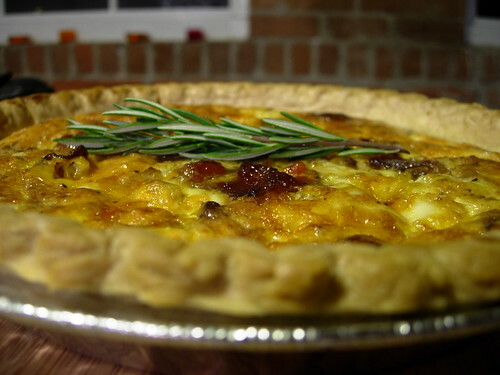 I think the masterpiece contained bacon, mushrooms, cheddar, shallots, and rosemary. 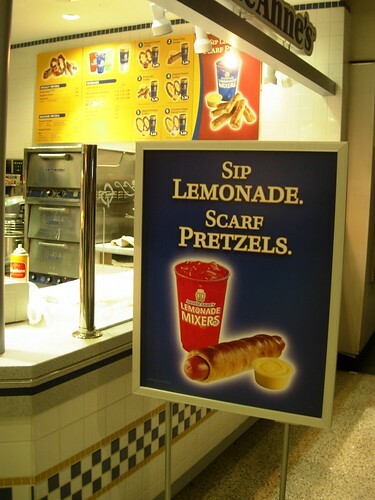 As the 4th largest U.S. City, with incredible diversity, Houston provides many choices for the discerning restaurant goer. It is, however, a sprawling mess with highways connecting highways. It was a little too much to tackle in a month, so I generally limited my exploring to downtown and the Montrose/Heights areas. Also, I’m pretty intimidated by BBQ, so I only tried once at Hickory Hollow and probably wouldn’t again. I hear Goode Company is the place to go, although I didn’t get there (or head out of town to the hill country for the real Texas deal). La Guadalupana Bakery and Cafe has great cinnamon coffee (took me two cups to get used to) and yummy baked goods and breakfast items. They’re super nice and patient with my subpar Spanish. 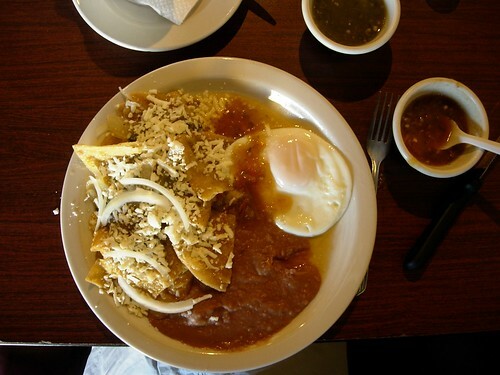 I had a phenomenal croissant and tried chilaquiles for the first time. In was a momentous breakfast moment. 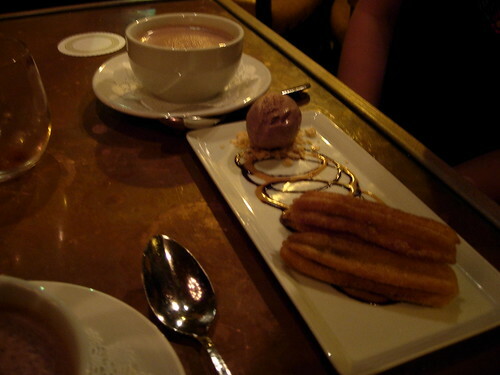 Nina and I had the best churros ever at Hugo’s. We had lots of pho at Pho Saigon and Bánh mì at Les Givrals. 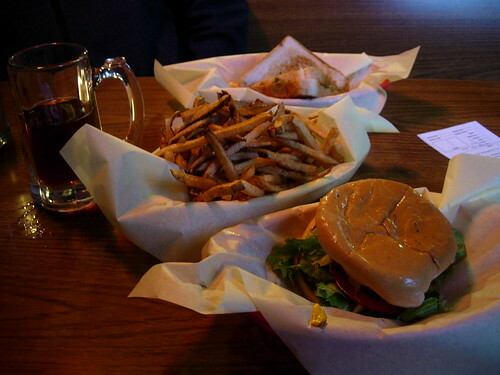 And we had a great final meal at Broken Spoke Cafe, a Belgian eatery where arriving by bike gets you 10% off. I had mussels in a tarragon sauce, an endive salad, and a Belgian beer I can’t remember. As for drinks, I lived around the corner from La Carafe, the “oldest bar in Houston”, but only managed to go once. The jukebox had great jazz, but we witnessed the bartender being really weird and awkward, which is probably the reason I didn’t go back. 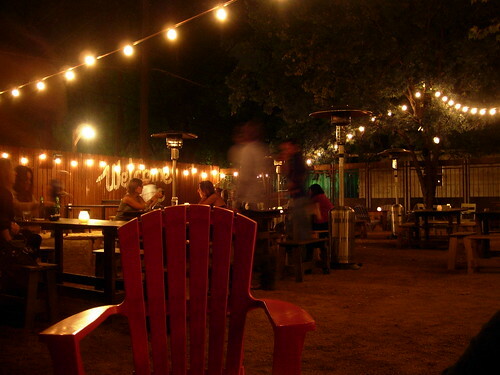 Good food and coffee can be found at Brasil which has a great outdoor space and shows movies nightly. My biggest regret is not trying the fried avocado at Haute Texan Taco Truck. If you’re in town, find out where they’re parked on twitter and let me know how it is. Nina and I made latkes for the first night of Hanukkah last night, opting for a variation of the traditional potato latke (aka pancake) with this Red Flannel Latke recipe from the NYTimes that includes beet and celery root. This was my first latke making experience, so I relied entirely on Nina and Mark Bittman. For Nina’s nostalgia we made some regular sized latkes, but as my patience is low for watching oil do its magic, I pushed for Bittman’s style: one big fat latke. We also travel with limited supplies, so we didn’t have a grater. We used a peeler to peel the potatoes and then proceeded to peel the entire potato. I think all in all we ended up with some pretty fancy latkes. 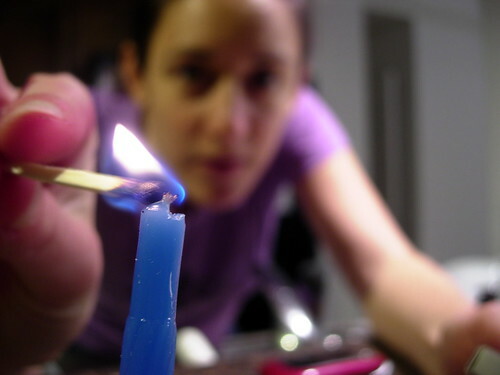 We added gobs of sour cream, lit candles, and Nina sang. 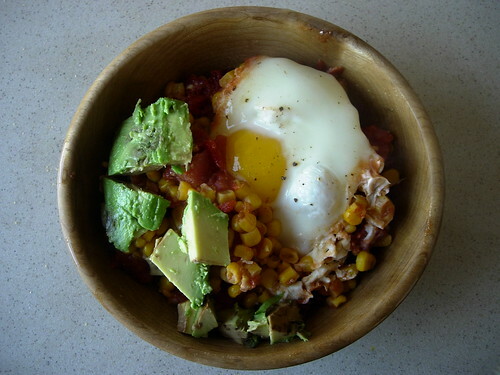 Nina suggested I turn the leftovers into a yummy Saturday morning breakfast, which was pure genius. Potato, beets, onions, celery root, and a fried egg. (Nina not only knows about Jewish foods, she knows about words and radio too!) Happy Hanukkah, and hooray for food that brings us together. Once upon a time I made a promise that I would be with my family for Thanksgiving no matter what. I would spend my last dime to get home and tell all my other obligations to screw off. I have broken this promise three times (no, not in a row!). 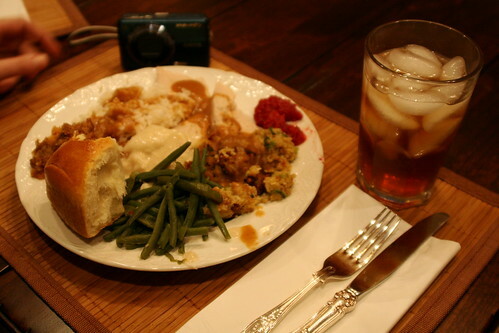 The first, I was overseas, and I attempted to make my own Thanksgiving in a country that doesn’t have turkey or pumpkin. And, I had invited over a vegan. Let’s just say it wasn’t the same. These last two years I have been on the road, traveling with coworkers and friends and as we’ve been open to new people and places every single day, we’ve been open to new families, new foods, and new traditions for Thanksgiving. I still love my mom’s Thanksgiving best, but I’m in awe of the hospitality I’ve experienced when I couldn’t be home for turkey day (Thanks Megan and Family!). Hopefully I remember this when I have a home to invite people to. This year I’m thankful to have tried chicken and dumplings. Oh. Man. We followed more local recommendations for breakfast and coffee, starting with breakfast tacos (new to me) at Juan in a Million. Juan in a Million won the Best Handshake from a Restaurant Owner, and I’d agree. We were taken through a rowdy dining room back into what appeared to be an empty employee cafeteria, but people soon began to trickle in, and the atmosphere improved. 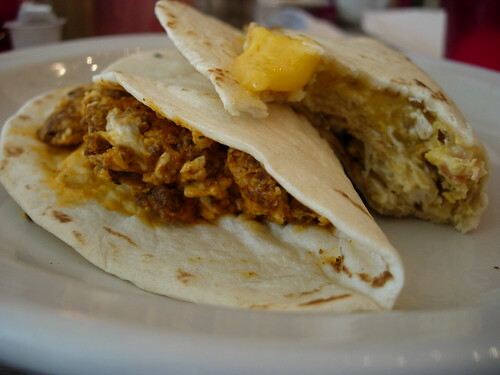 I tried the egg and chorizo taco and a migas (scrambled eggs with tortilla mixed in) taco. Both were delicious. Before hitting the road again, Coffee was necessary. 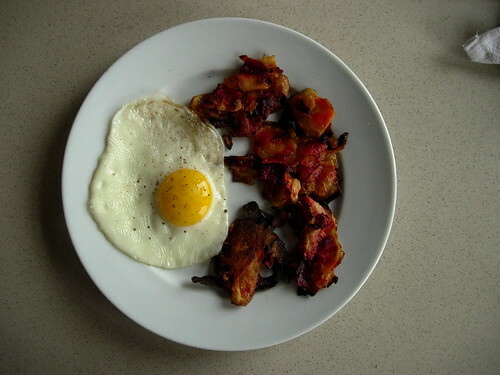 Photo by Matt Herman, from a generic hotel continental bkfast. 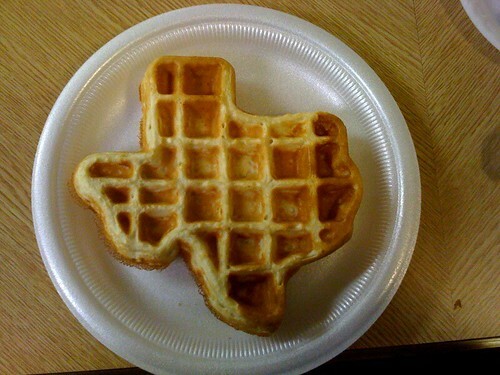 Come on NY generic hotels, get your waffles together.